Dahani Gudiel, 25, from Guatemala turned herself and her three daughters in to the U.S. Customs and Border Protection outside of McAllen, Texas on Monday. Gudiel says she crossed the border seeking asylum after being threatened by gangs at home. President Trump took to Twitter yet again today to threaten a government shutdown. He's demanding that Congress fund his immigration priorities, including money to build a wall along the Mexico border. Congress has until the end of September to work out a deal with the president. Well, the busiest section of the U.S.-Mexico border is the Rio Grande Valley in South Texas. Our co-host Ari Shapiro spoke with the man in charge of securing that stretch of the border. We'll hear that conversation in a moment. First, he went on a ride-along with a border agent to see what a typical day there is like right now. ARI SHAPIRO, BYLINE: I ask Agent Robert Rodriguez what has changed most during his years patrolling this section of the border, and he says he'll show me. We drive through McAllen, Texas, past orange groves and fields of sugarcane and pull up to a stretch of border wall. This part of the wall was built almost a decade ago, and, Agent Rodriguez, you've been working here about 10 years. How has that changed the way you see people crossing, the numbers of people? ROBERT RODRIGUEZ: It was very common to see a group of 40, 50 coming across at one time in this area. That has gone down, if not to about half, even less. SHAPIRO: About 55 miles out of 317 miles along the river are already covered by a wall in this sector. We walk a couple hundred yards to the border itself, the Rio Grande, where a long slope of rocks leads down to the water on the U.S. side. Trees and shrubs line the Mexico side. Rodriguez says cartels control all the illegal border crossings here, and they have years of experience learning how best to evade agents like him, like - they use scouts. RODRIGUEZ: That's where they're normally at. SHAPIRO: You know the exact trees. RODRIGUEZ: For sure. And it's kind of easy because they pick the highest trees because they want that - the best vantage point that they can get. SHAPIRO: Yeah. And I imagine they know your tactics as well as you know their tactics. This is, like, a well-trod path. Rodriguez says the people who enter the U.S. here fall into two general groups. Half don't want to be found. They might be smugglers. The other half want to claim asylum, and they are hoping agents find them as soon as possible. UNIDENTIFIED PERSON #2: Hey, Dan, do you copy? SHAPIRO: Over the radio, we hear that a group of people has crossed the river moving slowly. RODRIGUEZ: See; there they are. They're right there. SHAPIRO: ...A lot of abandoned clothes. Where? RODRIGUEZ: Right in front us. There's people right around the corner. SHAPIRO: Yeah. It's a group of about 10 people - little kids - and another group coming. There's a woman carrying a baby. There's probably about six kids under the age of 10. SHAPIRO: Eventually, about 25 people gather in the shade by the side of the road. About half of them are young kids. Agent Rodriguez goes through the line and asks people where they're from. SHAPIRO: These days, 80 percent of the people who cross the border here are not from Mexico. Most are from Central America, trying to escape gang violence. Agent Rodriguez tells everybody, sit down; take everything out of your bags; take off your shoe laces, everything out of your pockets except for paper money and ID. The immigrants are hardly carrying anything. Each person gets a clear plastic bag to put their belongings in. SHAPIRO: Dahani Gudiel came from Guatemala with three kids - a 7-year-old and 4-year-old twins. GUDIEL: (Through interpreter) Four months ago, my husband died in Boston, and I was receiving calls threatening me because they thought I had inherited money. They told me to pay them $2,000 by August 1. They told me that they were watching my daughters and that if I didn't get them the money in time, something would happen to them. So I decided to come here. SHAPIRO: She told her kids they were going on vacation. Another woman in the group, Jessica Carolina Santos Lopez, came from Honduras with her 9-year-old daughter and a 10-month-old baby boy. She told me the worst part was when the smugglers put her group in a trailer for three days. JESSICA CAROLINA SANTOS LOPEZ: (Through interpreter) We suffered. I even vomited because I got dizzy. I was scared because I felt like I was suffocating and my son, too. So I kept putting water on him. SHAPIRO: The baby has rashes from the heat. I ask them whether they've heard about family separation or about the Trump administration limiting the grounds people can use to claim asylum. They say they haven't heard about any of it. Back in the car, I ask Agent Rodriguez about that, and he says you can't always believe these stories. So you think they probably have heard this and are just telling us what they think we want to hear. RODRIGUEZ: Very possible. How many of those folks did you talk to that have relatives in the United States already? SHAPIRO: I think all of them had some relative in the United States, yeah. SHAPIRO: So you think they were probably keeping their relatives informed. RODRIGUEZ: A lot of times, they're coached on what to say. SHAPIRO: In this case, we just don't know. The man in charge of the entire Rio Grande Valley for the U.S. Border Patrol is Chief Manuel Padilla. When we sat down in his office, I began by asking him whether he learned any lessons from the last two months of protests and chaos surrounding family separations. Do you think there were any missteps? Do you think there's anything that should have been done differently? Are there any lessons learned from this experience? SHAPIRO: You mean it worked in deterring people from crossing the border. SHAPIRO: Whether it worked as a deterrent is different from the question of, do you think it should have been handled differently? PADILLA: So exactly. Operationally, it did what it needed to. I think from the humane piece, there was - it was very unpopular. I think even the president and the first lady were saying, hey, you know, nobody likes a separation of the family. Nobody is in agreement with that. But what do you do now with that population? We're back to square one, right? We have to do something. SHAPIRO: So that's the next question. What happens if you detain a family? And this policy has been so widely condemned. What do you do now? PADILLA: Exactly. What do we do now? SHAPIRO: You're the man who has to answer that question. SHAPIRO: Well, you're detaining people every day, and Congress is not acting quickly. PADILLA: Right. So until there is immigration reform, you will continue having this problem, and it will go from this administration to the next to the next. So at some point, Congress has to fix this. SHAPIRO: You're known as a turnaround expert. You've been in CBP for 30-some years. You used to be based in Tucson where border crossings fell dramatically during your tenure. And in 2015, you were asked to come here to the Rio Grande Valley, which now is the biggest sector for border crossings. What do you think it'll take to accomplish the same kind of turnaround here that you saw in the Tucson area? SHAPIRO: Because people hide in the underbrush. PADILLA: Absolutely, and it just requires a lot of effort and then that's that 50 percent of border security. The other 50 percent also draws down a lot of personnel, which is the family units, from detaining them to processing them and to managing the centralized processing center. SHAPIRO: President Trump has been tweeting about border security this week. On Sunday, he tweeted in part, I would be willing to shut down the government if the Democrats do not give us the votes for border security, which includes the wall. Is that helpful - those kinds of tweets? SHAPIRO: I mean, having President Trump tweet, like, I would be willing to shut down the government. PADILLA: I have - I'm an operator. I'm not a politician, right? So I can tell you from a border security respect, we have a very, very bad border here. We're looking at about 270 percent increase in MS-13 gang members being arrested. And the good news for us here is they don't stay here. They go to Maryland. They go to Houston. The bad news for the United States is the flow of this very troublesome criminal element. SHAPIRO: Manuel Padilla, thank you for having us in your office here today. PADILLA: Thank you, sir, appreciate it. 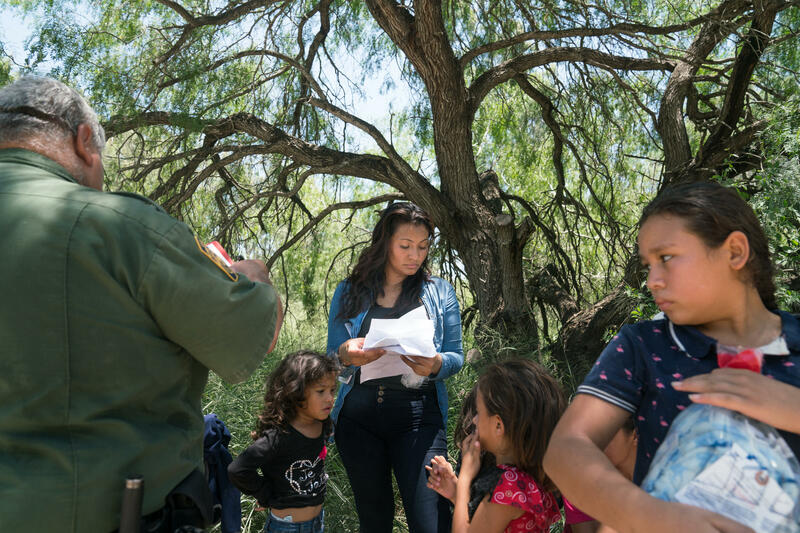 SHAPIRO: He's the chief of the Rio Grande Valley section for U.S. Border Patrol. Tomorrow we'll visit the Mexico side of the border to meet people about to cross and some who've just been deported. CORNISH: That's our co-host Ari Shapiro reporting from the U.S.-Mexico border. Transcript provided by NPR, Copyright NPR.